This spicy chicken wings recipe can be adapted and used with chicken thighs, drumsticks or even pork ribs. They can be used for meals, picnics and make delicious party food served either hot or cold. If using chicken drumstick or thighs remove the skin to make a lower fat meal. To do this grip the chicken with a clean dry tea towel and pull the skin. It will come away easily. You could roast the skins for tasty treats for your dog. Remove skins if using drumstick or thighs and prick well with a fork. Place into a large Pyrex mixing bowl – two if making a large quantity. Add the curry powder, honey, garlic powder, soy sauce and chilli powder and coat the chicken well. Tip in the sweet chilli sauce until the chicken is well coated – this recipe could use the entire bottle. Make sure that the chicken is well coated and cover with cling film. Keep chilled overnight in a fridge. Preheat oven to 210ºC or gas mark 7. Grease a large roasting tin and place the chicken evenly in the tin spooning a little of the marinade on top to ensure each chicken piece is well coated. Roast for 45 minutes in the centre of the oven until well cooked. Make sure the dried chilli does not burn. Drain off any excess fat so that the chicken cooks dry. Remove from roasting tin and place on a cooling tray until cold. The chicken should have a hard coated covering with the chicken meat being tasty and tender. This chicken dish can be served cold with salad or hot with savoury rice as a main meal. As party food it can be served cold on a buffet table but remind guests that it is very hot and spicy! 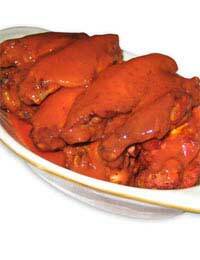 If you are serving a hot buffet reheat the cold spicy chicken for twenty minutes in a hot oven. Children these days seem to like to try the hotter spicier foods. Even so this dish can be very hot so perhaps make a slightly less spicy batch for them and for adults who prefer less hot food. Cut the chilli powder back to half a teaspoon and omit the dried chilli completely and the dish will be a lot less hot. If this is still too hot omit the sweet chilli sauce and increase the honey for a sweeter tasting chicken meal. This type of finger food can be made from any spices found in your store cupboard although it is essential to have the honey to help the spices to stick to the dry chicken and also the sweet chilli sauce to give a spicy fluid to the dish.